Abstract: Enthusiasts want fast memory with aggressive memory timings. None of this 3-4-4-8 stuff here! Enthusiasts want fast memory with aggressive memory timings. None of this 3-4-4-8 stuff! 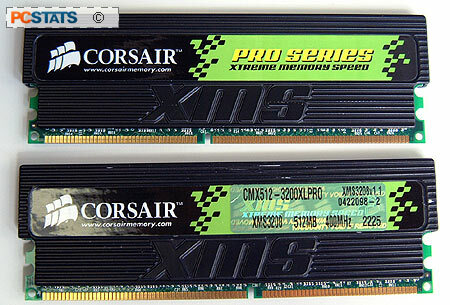 Luckily for you and I, Corsair have just released some new PC3200XL DDR memory which is rated to run with a CAS latency of 2-2-2-5, at 200 MHz. The new Corsair XL line is surely a sign of things to come, but you may have to wait a little while before any other memory manufacturer releases anything like it. Now, what exactly are we looking at here? Well, each stick of Corsair TwinX 1024-3200XL Pro DDR is 512MB in size (for a total of 1024MB of dual channel DDR), and thanks to the nice new Samsung DRAM, boast CAS latencies of 2-2-2-5 @ 200MHz. Sweet memory indeed. Being that the modules PCstats is testing are the Pro-varient, each DIMM is encased in cast-aluminum heatspreaders with nine rows of LED's (18 in total) along the spine which indicate memory activity! At the heart of Corsair's TwinX 1024-3200XL Pro DDR are Samsung DRAM, but unfortunately the heatspreaders are bonded to the DRAM memory modules otherwise we'd remove them to take a look at what rests beneath... we always try to show you the actual DRAM markings after all. Corsair officially rate the memory to run at 200MHz, while keeping memory timings of 2-2-2-5, which means this DDR RAM is ideal for AMD AthlonXP, AMD Athlon64 and Intel Pentium 4 systems. If you're into overclocking, you'll be interested to hear that Corsair's own internal tests show this DDR RAM is capable of running up to 250 MHz, with timings of 2.5-3-3-7 with a modest voltage increase! We'll be testing this ourselves naturally, but it does indicate just how flexible this memory should be for the overclocker. If you tend to push your Intel Pentium 4 system, you'll be glad to hear that the Corsair TwinX 1024-3200XL Pro DDR is up to the challenge! 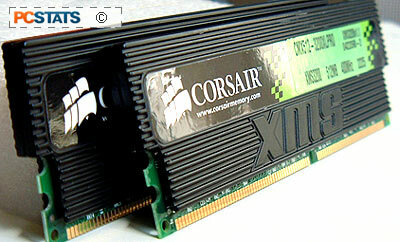 In fact, with 2.5-3-3-7 timings at 250 MHz, it means that this memory should be faster than equivalent PC4000 DIMM's. As usual we plugged the memory into our AMD Athlon64 test system first, setting the timings to most aggressive. I slowly raised the motherboard clock speed next,and at 212 MHz there was a bit of instability. This was cleared by increasing the VDIMM voltage to 2.8V. Continuing on, the TwinX 1024-3200XL Pro DDR seemed to hit that magical wall at 225 MHz - no matter what we did we simply could not push it any further. On the Intel test system, the FSB was raised slowly from 200 MHz at first, but at 215 MHz the TwinX 1024-3200XL Pro DDR memory began to flake out. Raising the VDIMM voltage to 2.8V helped at first, but after 217 MHz it hit another barrier. Remember that Corsair used higher latencies here, so I lessened the timings to 2.5-3-3-7, and was then able to go up much higher. At 260 MHz the TwinX 1024-3200XL Pro DDR memory maxed out though. Increasing the voltage further, say to 3.0V, won't do anything but generate more heat since there is voltage regulator on the IC according to a Corsair representative we spoke with.